Wang Chueh-Jen (王玨錱) came from a rich family. His father, Wang Ting Yuen (王聽緣), was a well known Kung Fu Master in Si Chuan province. Grandmaster Wang first studied from his father before his father hired a different master to teach him and his brothers at home. Wang eventually inherited the Tien Shan Pai style from 62nd generation Grandmaster Ho Ta-Sun (何大順), also known as Ho Yuen-Ching (何偃清). Tien Shan Pai is a northern style which originated in the Tien Shan (天山派) mountains of northwestern China(see “The Legendary Origins of Tien Shan Pai Kung Fu” for details). It is well known in Taiwan (台灣) as an effective fighting style. At the same time, it also contains graceful empty-hand and weapons forms stressing rhythm and “yin shou” (音手)–the demonstration of power accentuated by solid thuds made by the hands. Tien Shan Pai self-defense is characterized by attacks from the side coupled with multiple blocks, so that if one block fails, the second can cover. Footwork is considered essential to countering attacks; Tien Shan Pai focuses on low, steady steps to the side, along with swift “hidden” steps to trick the opponent. 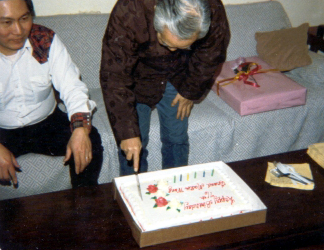 Wang and students 63rd Generation Grandmaster Wang celebrates his birthday in 1986 in the U.S.
Tien Shan Pai has long been popular in Xinjiang (新疆), Gansu (甘蜀) and other western provinces; however, it was not well known in eastern China and Taiwan until Wang Chueh-Jen taught there. Through many years of study and teaching, Grandmaster Wang refined a style of combat he called “radar style fighting” (雷達式打法). Many of his early students competed in “lei tai” (full contact fighting) tournaments, all giving outstanding performances, with some winning championships. At that time (1955), there were no weight divisions (until 1957, when three weight divisions were established) and no protection. The last such tournament without protection was the 5th World Chinese Kuoshu Championship Tournament held in Taiwan, Republic of China in 1986. Wang Chueh-Jen continued to teach Tien Shan Pai until his death in 1990. 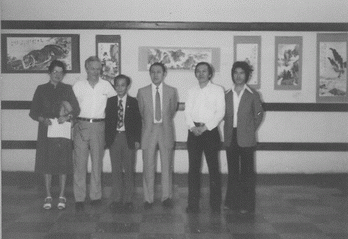 During a visit to the U.S. in 1986, he informed Huang Chien-Liang that Huang was his only formal disciple. 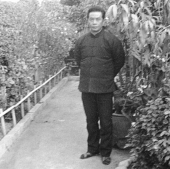 Currently, Huang Chien-Liang is one of the few teachers from Supreme Master Wang Chueh Jen still teaching the Tien Shan style in the United States.